On Sunday afternoon, thousands gathered at Jantar Mantar, waving blue flags with Bhimrao Ambedkar’s image, shouting ‘Jai Bhim’ slogans, and donning masks of Chandrashekhar’s face. It was on July 21, 2015 — at a time when Vinay Ratna Singh and Chandrashekhar were fresh out of college and looking for employment — that they felt the urge to do something which could uplift their community. “We felt that if we can do anything for the country, for our people, it had to be with education. On July 21, we held the first meeting of the Bhim Army and decided to start paathshalas in our area to offer free education to our children,” said Singh, co-founder of Bhim Army. From the first paathshala — set up at Fatehpur Bhado village in Saharanpur nearly two years ago — to around 350 now, which are running not just in Saharanpur but also in the neighbouring districts of Muzaffarnagar, Shamli and Meerut, Bhim Army claims to have come a long way. 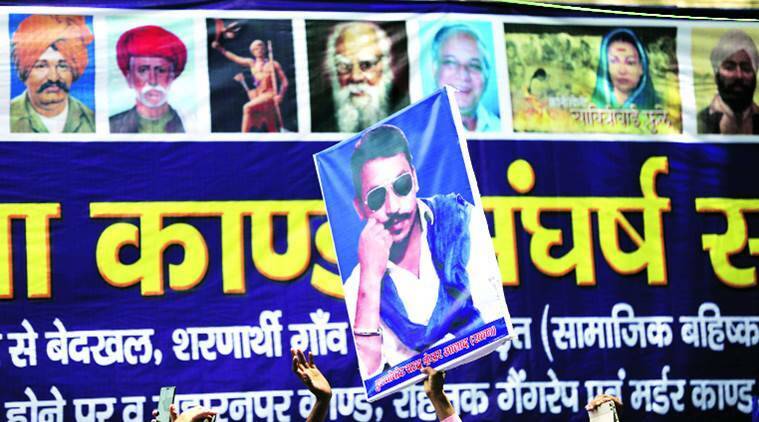 Tracing the development of the Dalit organisation, Singh said: “Near AHP College in Saharanpur’s Chhutmalpur area, a Dalit student was beaten up by members of the Thakur community for drinking water from a well. When we raised the matter with the administration, we received threats from various quarters. But we did not buckle under pressure. Besides, there were atrocities against women apart from cases of caste discrimination. We would raise these issues with the administration and hold protests in order to get justice,” Singh says. On Sunday afternoon, thousands gathered at Jantar Mantar, waving blue flags with Bhimrao Ambedkar’s image, shouting ‘Jai Bhim’ slogans, and donning masks of Chandrashekhar’s face. For members of the organisation, however, the response was a result of the work they had done in the past two years — from raising issues relating to caste discrimination to atrocities against women, along with the spread of their paathshalas. “We believe in the constitution of this country but we were branded as Naxals, because we opposed the picking up innocent young people and arbitrary police raids. We have received threats. We were told that if the society is yours, the government is ours, where will you run away? It is our contribution to the country which has resulted in this support,” Singh says.